Once we recognise that the flow state is our original and natural way of being, instead of trying to create the “conditions” for flow we can learn how to access it directly and let flow infuse every aspect of our lives - let genius shine into all our doing, replace chaos or stress with clarity and ease, and to gain insight into the true nature of our problems so they can be resolved easily at their cause. P.S. 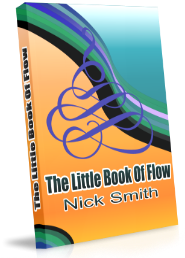 In addition to the A Little Book Of Flow free ebook, you also receive 50 more self improvement gift ebooks for download. A link is sent in your first email.